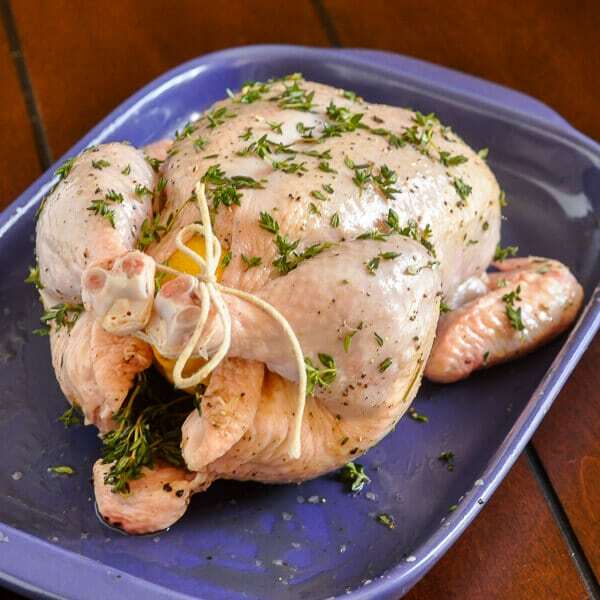 Lemon Thyme Roast Chicken - brined in lemon & thyme. Lemon Thyme Roast Chicken. Whether unbrined or with the option of brining in lemon garlic, spices & thyme this is a super juicy and flavourful roast chicken recipe that makes the perfect Sunday dinner. UPDATE April 16, 2016 – today, I’m updating this post with slight modifications to my brine recipe and a couple of extra tips. 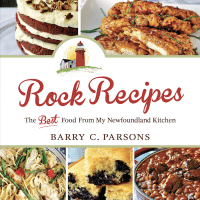 First of all, this recipe will be plenty flavourful even if you skip the bringing process. Lots of people have written to me over the past few years to say just that. If you don’t have time to brine, don’t let that deter you from trying this recipe, it’s still one of the best roast chickens you’ll ever try. I would say if you are not brining, you’ll probably get best results with a fresh and not a frozen chicken. I don’t use as much salt as many do in their brines but I’ve modified the amount to provide a bit more seasoning to the meat. Also the amount of brine in this recipe is really sufficient for 2 chickens or a turkey. If making only 1 chicken you can easily make only half of the brine. Another tip is to use a large enough container, don’t crowd your chickens or turkey into too small a container and decide not to use all the brine you’ve made. I have a large food grade plastic bringing bucket but lately I’ve been using a camping cooler (even a styrofoam disposable one will do). I use a bag of ice still in the bag, added to the cooler to keep everything nice and cold for 24 hours. 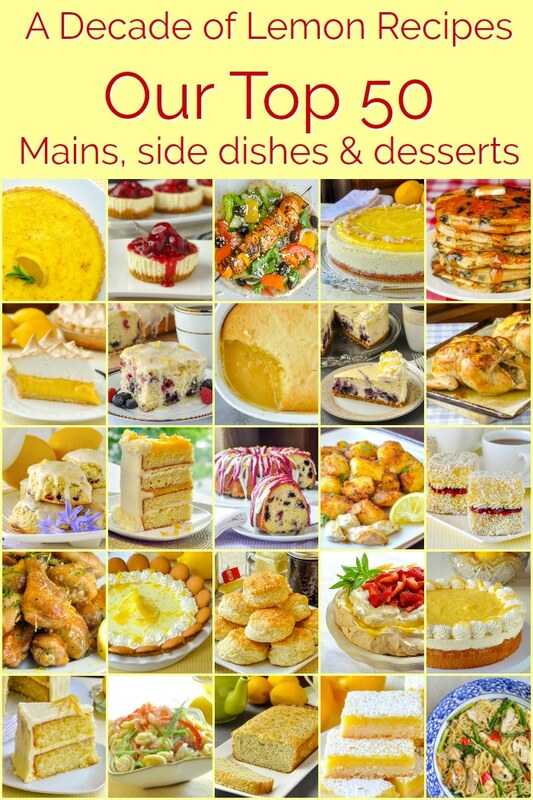 One thing I didn’t mentioning the original post was that when I carve the chicken or turkey onto a platter, I cut the hot lemon in half and squeeze the juice over the pieces before serving for an extra punch of bright lemon flavour. On this occasion we also served the chicken with one of my kids favourites, Smash Roasted Potatoes which are pictured in the background with some simple steamed broccoli as side dishes for this satisfying comfort food meal. This simple brined roast chicken was Sunday supper for us this week. It is definitely the most flavourful roast chicken I have ever eaten. Our whole family loves this roast chicken and if leftovers are planned I have to make two of them for sure. Boiling the lemon for the cavity is a great technique that I saw on one of Jamie Oliver’s shows a while back, because it gives the lemon a head start in infusing the meat with flavour; it works really, really well. 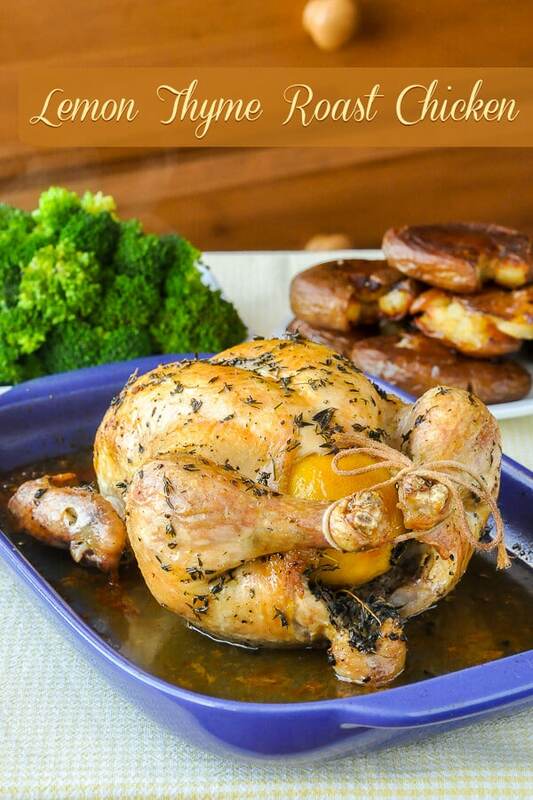 Like this Lemon Thyme Roast Chicken recipe? Lemon Thyme Roast Chicken - brined in lemon, spices & thyme. 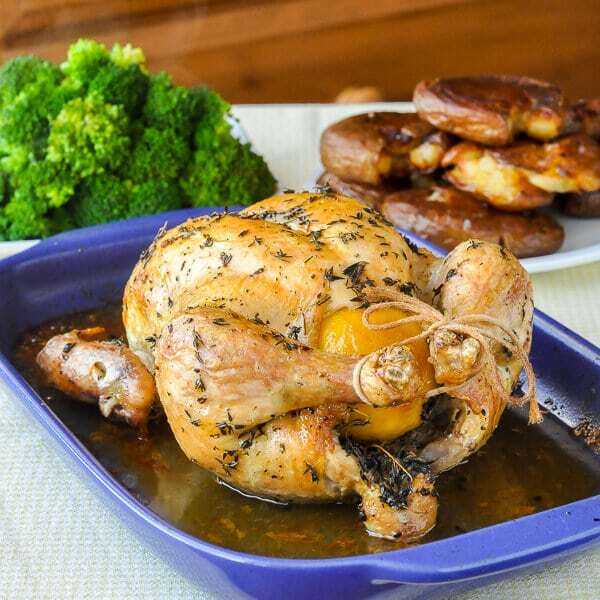 A super juicy and flavourful roast chicken recipe that makes the perfect Sunday dinner. In a small bowl combine the peppercorns, thyme, anise, cloves and boiling water. Set aside to steep for a few minutes while you prepare the rest of the brine. In a large bowl combine the 6 litres water, lemon juice and peel, garlic, onion, sugar, salt and fresh thyme if you have it plus the herbs that have previously steeped. Stir until the sugar and salt are dissolved, then submerge the chickens entirely in the brine. Cover and refrigerate for several hours or preferably overnight. Pull the chicken from the brine and pat the skin dry with paper towels. Rub the entire surface of the chicken with the olive oil. Season the skin with salt and pepper and a little chopped fresh thyme. Boil 1 lemon for about 10 minutes. Stab the lemon about a dozen times with a fork and stuff it into the cavity of the bird along with the thyme and garlic cloves. Roast uncovered on a rack in a preheated 375 degree F oven until a meat thermometer reaches 185 degrees when inserted into the thickest part of the breast meat ( approximate 1 ½ hours or longer depending on the actual weight of the chicken). Allow the chicken to rest for 10 - 15 minutes before carving. Cut the lemon in half and squeeze the juice onto the carved chicken pieces before serving. Chicken, lemon and thyme are match made in heaven. Yours looks divine. This sounds really good. I have a nice pot of thyme just waiting to be snipped. Thanks for re-sharing this and for the tip of boiling the lemon. Great idea. I am planning to roast a chicken with these potatoes. Can I start the chicken, then add the potatoes and roast together? I’d say open roast it all at the same time if you have a smallish chicken. You can always put the potatoes back in for the resting time of the chicken before carving.